I used to think that being blonde meant I couldn't (or shouldn't) wear yellow, but I've long since changed my mind. In fact, I think bright yellow looks pretty darn great on lots of hair and skin tones. The trick is finding the right yellow. Blondes should steer away from pale yellow, as it can sometimes make us look a little sallow. Instead, opt for brighter shades, like the lemon-colored skirt in the photo above from Riffraff. Brunettes can pretty much get away with any pigment, and redheads - the brighter the yellow, the better. Toss in some funky polka dots and you've got yourself a cute little combination. Until tomorrow, gals and dolls. 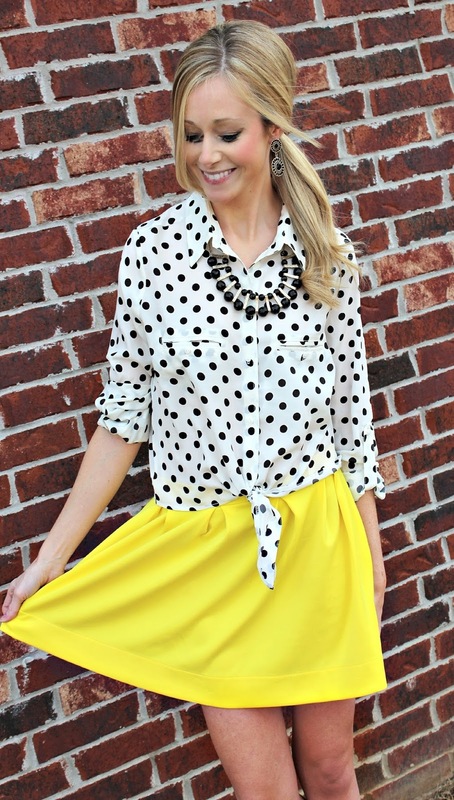 I love how the black and white polka-dots look paired with the yellow skirt! That shade of yellow really pops! polka dots make anything great! I looove me some polka dots! What a fun pairing with the bright yellow! You are a hot mama! Love this on you. And I love that color for the spring! That color is GORGEOUS! You should probably rock that every other day from now on (too much?). This is a great outfit for Spring and it looks like it would be super versatile! I love yellow on blondes! That skirt is so fun and looks great on you! Yellow looks gorg on you! Adorable as always!